Before trying the Bollé B-Rock cycling glasses, I’ve been very one-dimensional in the domain of cycling glasses over the past couple of years. Yellow Oakley Prism road glasses have formed part of my team outfit, leaving me accustomed to one specific look and feel. As a result, the first time I put the Bollé B-Rock glasses over my eyes, two completely new sensations came rushing to mind. They felt light – but were they actually? I wore these glasses while riding the length of New Zealand and I’d often forget that they were on my face, even though I spent 8 hours or more in the saddle most days. The large frame, in addition to the lightweight design, created the illusion that the blue-violet lens was actually embedded into my retinas, enhancing the sunlight reflecting off the glorious snow-capped mountains. After getting home from my New Zealand journey, I was curious. How much did the B-Rocks actually weigh? Despite being a larger design they definitely felt lighter than my Oakleys. 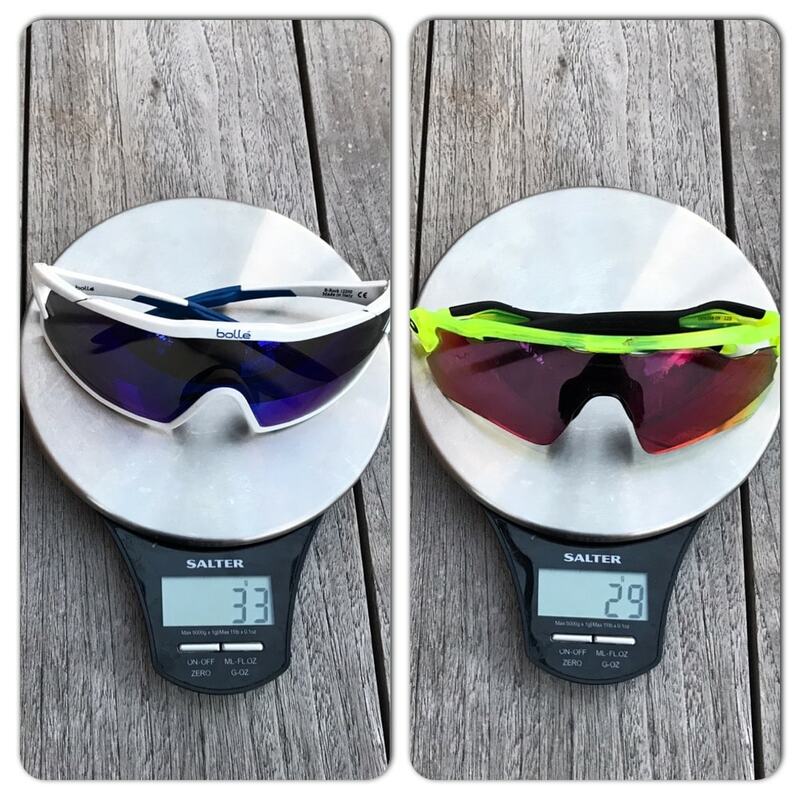 The weigh in: B-Rocks were 33 grams and the Oakley Prisms 29 grams. This result caught me by surprise. I weighed the glasses three more times, just to make sure the scales weren’t playing up. 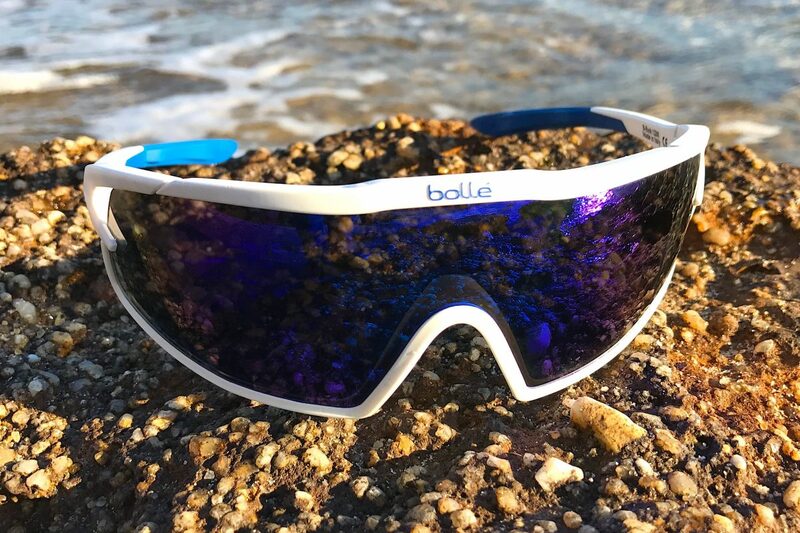 The Bollé B-Rocks weigh slightly more than the Oakley Prisms, but they feel much lighter on your face. 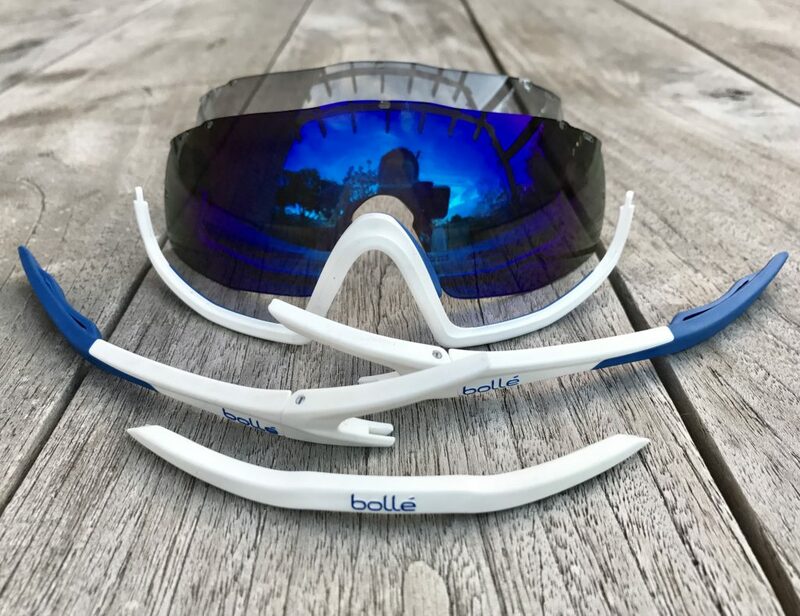 After examining the glasses further, I realised that the design of the two different glasses could be the reason why the Bollé B-Rocks actually felt lighter and less noticeable on the face. The construction of the B-Rocks is more well-rounded. The frame encompasses the entire lens, which ensures the weight is evenly distributed through the glasses. With the Oakleys, the weight is across the top of the lens, with the bulk appearing to be in the arms. While this gives the Oakleys a robust feel, the weight distribution is uneven, and they’re naturally inclined to tip forward. Thus, when you’re wearing them on your face for longer periods you are more likely to feel the weight on your nose in comparison to the B-Rocks. While the weight of most cycling glasses is minimal in the scheme of things, when you’re wearing glasses on your face for hours on end, you notice it. After wearing the B-Rocks for 13 days straight across 2,336 kilometres, I now definitely have a preference for glasses with better weight distribution, and thus, more comfort. When you put the B-Rocks on your face, you’re making a statement. They’re not an item that subtly blends in with the rest of your outfit. They become a key part of your look that incorporates your bike, lycra, helmet and shoes. Being a 36-year-old dad, I must admit that my fashion sense has waned over the last few years. These days I tend to stick with my safe-haven items that I’ve become accustomed to. In addition, the wisdom I’ve obtained from my 10 years of cycling has persuaded my core buying beliefs to stick with what I know. Putting the B-Rocks on my face for the first time was a sensory overload. My face style completely changed before my very eyes. The all-encompassing lenses endowed a new sense of sight, and I felt like I’d stepped back into my twenties; looking to make a bold statement with a pinpointed piece of attire. The white and blue frame with the blue-violet lenses, whilst bold, actually blended in seamlessly with my New Zealand attire. Whether I was wearing a red, blue or orange high-vis jersey, the style of the glasses appeared to work in nicely. While the lens is large, the frame is subtle. The frame colour would tend to match a colour on the jersey, bibs or shoes, making that perceived “bold” statement not-so-bold after all. 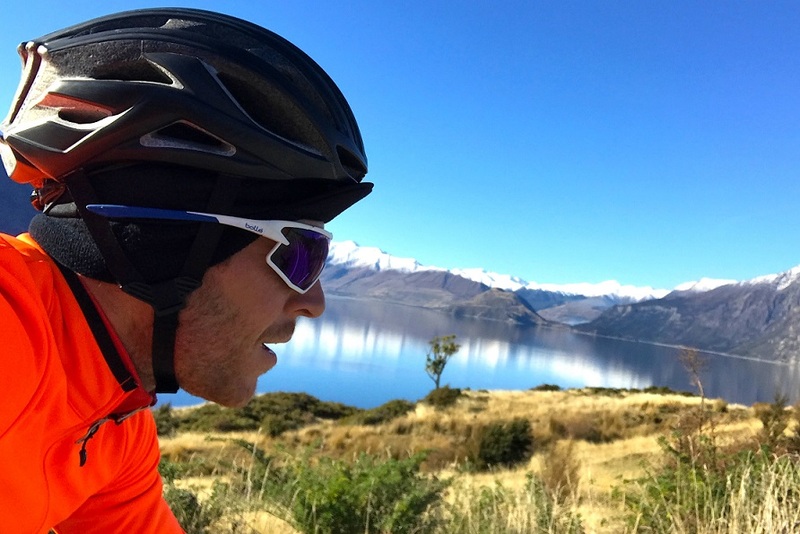 I wore the Bollé glasses throughout my ride through New Zealand, top to bottom. The frame size of the Bollé B-Rocks and the lightweight feeling was a blend of attributes that has changed my paradigm on cycling glasses. There are two reasons behind this. One is practical and the other is because I’m becoming a little self-conscious with age. As stated earlier, these frames are well proportioned in terms of weight distribution. You tend to forget they’re on your face. In addition, the large lenses cover the vast majority of your eyesight, giving you comfort that your vision is protected by the lens. At 36 I’m starting to see the signs of aging shine through. In particular, I’ve noticed that my frown lines are becoming more noticeable. Luckily, the B-Rocks cover not just your eyes but also reach across the top of your eyebrows. The wind effect from cycling can cause face lines to become more pronounced, so the fact that the glasses guard my frown lines against extreme weather is a big plus for me. The Bollé glasses are easy to take apart and put together. The Bollés are very agile and easy to deconstruct. Putting a new lens in is so effortless that I haven’t had that nervous sensation that I might be pulling to a point of something snapping or breaking. In addition, the arms are easily adjustable and bendable so the glasses definitely cater to different head shapes and sizes. The nose piece can be bent in and out to adapt to all types of nose widths. The ventilation systems sit on the outer of the lens, close to your temples. The ventilation appeared to work well across my New Zealand journey. Not once did I notice any lens fog. 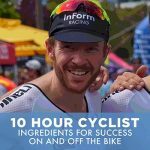 I have also tested this feature on some of the fast group rides in my hometown of Melbourne. Perspiration combined with a lot of stopping and starting tends to be the real acid test, and the Bollés have stayed effective. If you have a habit of dropping, knocking or squashing your cycling glasses, I originally thought the B-Rocks may not be well suited for you. While I personally had no issues with these glasses, their engineering lead me to believe (before I actually researched the frame material) there is a certain level of fragility that comes with the Bollés. If I make the comparison to my old glasses again, the arms and frame on the Oakleys, while creating some uneven weight distribution, feel strong and robust. I have dropped them multiple times and they have survived. Feeling their texture, I have confidence it would take a lot to break them. The Bollés, on the other hand, don’t quite fill me with the same confidence, but perhaps that’s just an illusion stemming from their weight and flexibility? When reviewing the technical materials of the Bollé frames I found that they use a “first press/virgin nylon”. This is nylon that has never been used or broken down before. The result is a super strong nylon frame that is less susceptible to fractures or breaks. A lot of other brands use the remains of nylon and re-break down the material again to create their sunglass frames. This will ultimately create a brittle material that is more likely to fracture or break. Interestingly, these poor-quality nylon frames are usually a lot stiffer, giving them a deceptive feeling of being more robust. While I haven’t focused on the lens quality in this review, I think with any set of glasses around the $250 mark, a high-quality lens is a given. Our eyes will be in good hands. The beauty of the B-Rocks is their bold style, weight distribution and flexibility. While the potential fragility could be a downside to those clumsy cyclists out there, the B-Rocks are definitely a high-quality pair of cycling glasses with unique and compelling characteristics. Looking for quality cycling glasses from brands like Bollé, Oakley, JetBlack, Tisofi and more? Check out Bike Chaser’s selection of cycling glasses from Australian retailers and private sellers.